Posted on Sunday, October 23rd, 2011 at 8:00 pm. 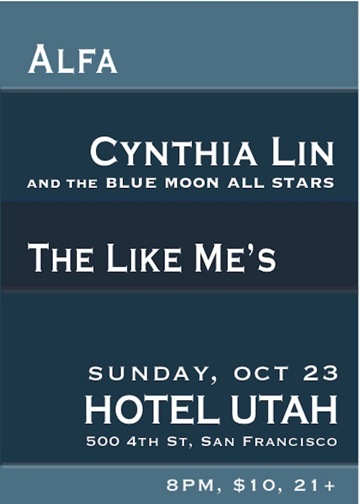 Taiwanese American singer-songwriter Cynthia Lin and the Blue Moon All Stars perform with special guests The Likes Me’s and Alfa. Cynthia celebrates the first year release of her latest album, Microscope. If that’s not enough, know that singer-songwriter Alfa is equally amazing and the all-female band The Like Me’s totally rock.